If you want your furniture to last and look as luxurious as possible, there are just a handful of simple guidelines to follow! Here at The Steam Team, we’re happy to help you learn how to care for your leather upholstery. Follow these three simple rules and you’ll be well on your way to success! Cleaning leather upholstery isn’t as complicated as one might think! Just keep a few microfiber cloths on hand for regular dusting, and use your vacuum cleaner attachment to reach the corners of your furniture and beneath cushions. For spills and stains, be sure you’re only using a cleaner that’s specifically formulated for leather furniture- and even then, it’s wise to perform a spot test. Leather is just like our skin, in that it needs to stay moisturized in order to stay healthy. Be sure to condition your leather furniture every 6-12 months, and maybe more frequently if your pets are allowed on the furniture. It also helps to keep leather out of direct sunlight, as this can dry out the leather or cause discoloration. Whenever your leather furniture is due for a deep cleaning or a professional conditioning, feel free to call in The Steam Team! Our leather technicians will have absolutely no issue restoring your leather to its original condition. You’ll be impressed with our results! And hopefully we’ll hear from you again, as we handle a wide array of cleaning and restoration projects! 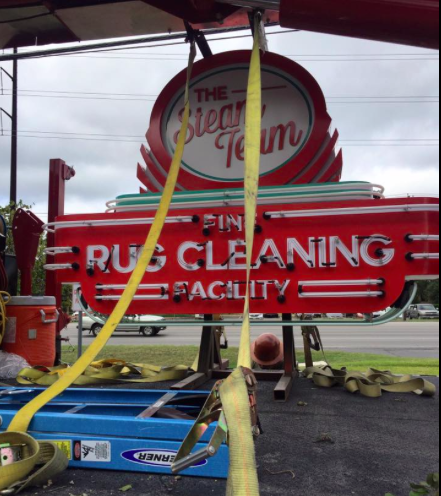 The Steam Team has been serving the city of Austin, TX for a long time now! We don’t plan on stopping anytime soon; we simply love what we do! So if your home could use a thorough deep, steam cleaning, or your leather furniture needs replenishing, don’t hesitate to give us a call! Here in Texas, the temperatures don’t drop too drastically during the wintertime. That means that we can still enjoy our patios- and our freshly stained concrete! Oh, you don’t know about concrete staining? That’s okay; we’re here to teach you. The Steam Team is a group of experts when it comes to concrete cleaning and staining (and a multitude of other tasks) so stay tuned to learn all about the perks of concrete staining! Obviously concrete staining is going to change the look of your patio. But this is a good thing! Aren’t you tired of that dull, grey, concrete color? We are too! Let us help you out by staining your concrete and revamping the entire look of your patio! A new patio does wonders to an old backyard. You’ll be so surprised at the results! And hey- maybe it’ll even inspire you to change up your landscaping, or build a matching shed! Well, okay, maybe building a shed would be going overboard, but even so, a freshly stained concrete patio will certainly revitalize that old, dingy backyard. As long as you have the right tools and information, concrete staining can be a fun DIY project for everyone! Although, if the concrete is uneven, the job may require some sanding and you may want to leave it up to the professionals. It all depends on your own level of expertise! Maybe you’ve started that DIY project, but can’t finish it correctly. Or maybe you don’t want to do-it-yourself at all! That’s okay! The Steam Team has your back. Just give us a call, we’ll be out in a jiffy, and we’ll either repair your concrete staining situation, or perform the task all by ourselves. Either way, you won’t regret relying on The Steam Team of Austin! Are you having trouble keeping your floor looking clean and bright these days? Well don’t worry; we’re here to help! The Steam Team has years of experience in brightening up flooring, restoring damaged flooring, and even installing new flooring! But today we’re going to discuss several ways in which we can bright our floors, no matter what material it’s made of! Steam cleaning is your best bet for cleaning tile flooring, as it reaches deep within the pores of grout, and erases stains and discoloration from tile, brightening your flooring. But if you don’t have a steam cleaner, can’t find one to rent, or haven’t called the professionals, you can also use a scrub brush and a formulated tile cleaner. Vacuuming is the best thing you can do for your carpet. Not only does it pick up dust, dirt, dander, and other substances, but it also keeps the carpet fibers from becoming matted and worn down. Vacuum at least once weekly to keep your carpet in tip top shape- and looking its best! It’s time to grab your mop, water bucket, and all purpose cleaner! After you’ve swept and vacuumed your floor, dip a microfiber cloth into a solution of warm water and your favorite cleaner (or the manufacturer's recommendation). Clean the floor thoroughly, ringing out the mop and changing the water whenever it becomes murky. Your floor will look nice and bright when you’re finished! No matter what type of flooring you have in your home, The Steam Team can help keep it clean, and even restore it back to its original condition! We have years of experience cleaning tile, grout, natural stone, carpet, air ducts and so much more. Don’t wait- just give us a call! We even clean high-rise buildings.